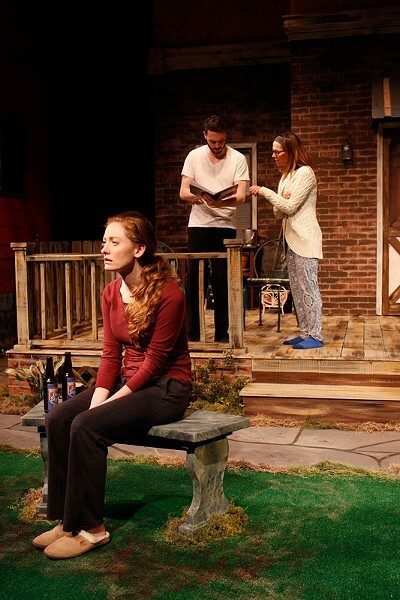 Jill Rittinger as Catherine, Colin Pazik as Hal, and Stephanie Sheak as Claire in the Blackfriars Theatre production of "Proof." Every thoughtful, well-planned theater season should have a family drama in the lineup: a play with a small cast, a compelling plotline, and (preferably) a strong female character. While "Annapurna" could have filled the quota in October, Blackfriars presents another sagacious selection with David Auburn's "Proof." "Proof" debuted at the Manhattan Theatre Club in 2000 and quickly transferred to Broadway the same year. In 2001, it nabbed several Tony Awards (including Best Play) and the Pulitzer Prize for Drama. By 2005, there was a film adaptation of "Proof" starring Gwyneth Paltrow, Anthony Hopkins and Jake Gyllenhaal. The play has since been a hit with regional audiences around the world. The name of the show is inspired by the central plotline -- a proof is an argument that proves a mathematical statement is true. Mathematician and University of Chicago professor Robert has battled mental illness for years, leaving him unable to work on any new projects. His 25-year-old daughter, Catherine, who has dropped out of Northwestern to care for him, shares his genius for math, but fears she also inherited his mental instability. Robert's former student, Hal, begins to go through the mathematician's 103 notebooks from his illness and kindles a romance with Catherine. Then, estranged sister Claire arrives from New York City. This is director Brian Coughlin's first show at Blackfriars -- his past directing credits are primarily from JCC CenterStage. Coughlin is an excellent directorial fit for the show: he seems drawn to productions that deal with family drama and mental illness. (His direction of JCC's "August: Osage County" in 2013 was successful, and many of the shows sold out.) Here, Coughlin masterfully navigates the four-person cast through sensitive issues and intimate moments, placing well-timed blocking and beats throughout. Jill Rittinger (Catherine) returns to the Blackfriars stage after a four-year hiatus, and she's landed a challenging role to reestablish her rank in the local theater circuit. The character of Catherine is demanding, both emotionally and physically: she experiences frequent highs and lows, and she's almost constantly on stage. It would be easy for an inexperienced actor to default to a two-dimensional character, but Rittinger is too talented for that. She has injected humor, sarcasm and warmth into her portrayal to balance Catherine's intense inner turmoil. While Rittinger is not 25 years old, she plays the role with a naiveté and rebellious spark that captures the turbulence of being a 20-something. (And even though Catherine is described as a woman in her early-to-mid-20s, the role was originated by 36-year-old Mary-Louise Parker on Broadway in 2000 and later played by 33-year-old Gwyneth Paltrow in the 2005 film.) In all, "Proof" is a victorious homecoming for Rittinger. Half of the cast are new-to-Blackfriars faces, a welcome ongoing trend this season. David Munnell (Robert) plays the loveable, irascible father with flickers of a past brilliance, while Stephanie Sheak (Claire) plays the tightly wound, high-performing older sister. Sheak brings an intuitive depth and richness to the role -- this, too, could have been a two-dimensional character. Colin Pazik (Hal) returns to Blackfriars after a recent appearance in "The Game's Afoot (or Holmes for the Holidays)," and he plays a sweet, convincing counterpart to Rittinger's Catherine. Set designer Roger Budnik has constructed a marvelous set that encapsulates a rambling old house on the fringe of downtown Chicago, complete with brick walls, a ramshackle deck, and an especially nice touch -- a softly lit lamp visible through a curtained window. Blackfriars' own artistic director Danny Hoskins creates the costumes, which nicely reflect each characters' stage and status in life, from Catherine's worn, flared jeans and down coat to Claire's designer yoga pants and track jacket. A mathematical proof requires a demonstration to prove that a statement is true. The cast's "burden of proof" is achieved as they take deeply emotional issues and deliver a genuinely thought-provoking, gratifying night of theater.